'Health' is a big topic to people regardless of gender, age and ethnicity. The Sutherland Shire Library Service, in partnership with the Health Promotion Services for Older People, recently organised two health talks for cultural groups in the shire as part of Multicultural Health Week. 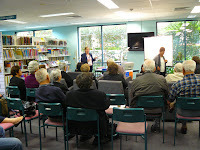 A 'Medicine Management' talk was held in Cantonese and Mandarin at Miranda Library for the local residents. Topics covered included "how to prepare yourself before you seek medical consultation", "how to handle medicine in daily life" and "what you need to be aware of in long term medication". This talk was received with interest and enthusiasm. Overall feedback was very encouraging with many participants asking for more topics in the future. Participants got to take home a bilingual information booklet for further reference. At Sutherland Library, a 'Diabetes Awareness' talk was held in Greek for the local community. The speaker Maria covered a lot of information on this very pertinent topic, including the different types of diabetes, the symptoms, causes and treatments. The large group asked many questions and it was an interactive session! A big thank you from the shire libraries to the two speakers and to the attendees, we hope to hold more topical health sessions in the future. The library holds a range of health information resources, both as books and online databases for members to access for free.